Have you ever been in a situation like, "I have only ₦10,000 and I want to have ₦50,000 in less than 2 weeks..."
It's not really that easy, but do you know that it is possible? Although there are some easy and profitable business opportunities for Africans, but many of them actually require much start-up capitals. Most of this businesses, you can achieve the maximum profit in less than 2 weeks if you use the best business approaches and make use of the best advertisement techniques. We have arranged the businesses in degree of convenience, profit potential, close monitoring and risks involved. The businesses listed below have been proven to be very lucrative, however it all depends on your hustle. You need to make use of these free advertisement techniques, study the environment to know what they are interested in, and one good news, you don't necessarily need to register your business. Depending on your area, you can make good amount of money daily buying and selling Compact Discs. How the business run is that you go to a wholesale distributor and purchase the discs for N80, then you sell them to your customers at N150 making a profit of close to 100%. With N8,000, you can purchase 100 CDs and if you can sell off the whole discs in 2 days, you'll be smiling home with a profit of N7,000. This business will go very well if you stay in a busy location. This fairly used clothes (popularly known as Okrika) can fetch you up to N50,000 profit in 2 weeks. The first key to being successful in this business is to stay in a busy location, then you can initiate a side attraction that will draw people's attention towards your shop. If you stay in a students' area, you can be making some good amount of money buying and selling kerosene to other people. How the business runs is that you go to a filling station to purchase up to 50 liters of fuel, then you can add extra N20 to N30 to the price per liter depending on your area and people will be patronizing you very well. If you can cook, then this will be a nice option for you. As long as the area is busy and you cook good foods, you are guaranteed of good daily sales. All you have to do it to buy some eggs, noodles, cooking ingredients and kerosene (or gas). A packet of noodles cost around N80 and you can use an egg (N50), and some other ingredients that won't cost up to N100. At the end of the day, you'll be spending N230, then you'll sell the noodles at N300 to your customers. An average adult will eat 2 packets of noodles, that mean a profit of N120 per customer. This is an amazing way of making good money with a little capital and I guess you'll be surprised after reading this. You can purchase palm oil at a very cheap price in big markets (Ebonyi state has the cheapest palm oil in Nigeria),then sell them off to the local consumers at a good price. From a market research that we conducted, if you invest N10,000 into this business, you can be making as much as N70,000 in two weeks although it depends on your area. This is another very good business that requires very little capital. You can buy chargers at wholesale prices of N120 ans sell them at nothing less than N250. That means you can make nothing less than N130 for each earpiece sold,this also implies to the other mobile phone accessories. Isn't that great, we have also published a post on how you can start making N150,000+ monthly selling phone accessories and you can check it out. This can fetch you good amount of money if you operate it in a busy area. With a small amount of money, you can purchase fruits in wholesale prices and sell them at retail prices to the local consumers. One major thing about this business is that it requires good attention and you should buy fruits with seasons. A great disadvantage of running the fruit business is that sometimes, the fruits might spoil if you are unable to sell them off on time. This is a good business to start if you don't have enough budget because of the little resources that are required to run it. Generally, you only need vegetable oil, stove and kerosene (or gas) and you're good to go. Then you'll also need to purchase nylons for selling the finished products to your customers. You can sell the chips in markets or other busy areas like motor parks. This is a low competitive business you can venture into if you have a little capital. The only issue with this business is that it involves a lot of stress. You'll have to carry your wares around for people to purchase them. Making good profit from the business is very easy because a bag of pure water costs N120, then selling it at N10 per sachet will give you a profit of N80 per bag. You can sell many bags a day if you stay in a busy area. This is another profitable business you can start as a Nigerian. All you have to do is to get a white fabric, rinse the fabric with soap and water and tie an end of it with an elastic band. Then tie the fabric severally but leave some spaces inbetween. Put some dye and slat in a boiling water, soak the fabric and you'll be amazed at the end product. This is how the popular Adire clothing worn by the Yorubas is produced. With a budget of N1,500,you can produce a cloth and sell it off at N2,500. These are just a few out of the many thousand way of making good money with a limited budget. 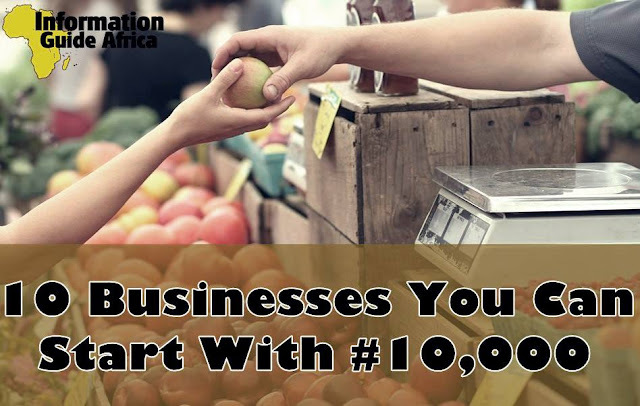 What if you have N100,000 to spend, then check out these 10 businesses you can start with N100,000.